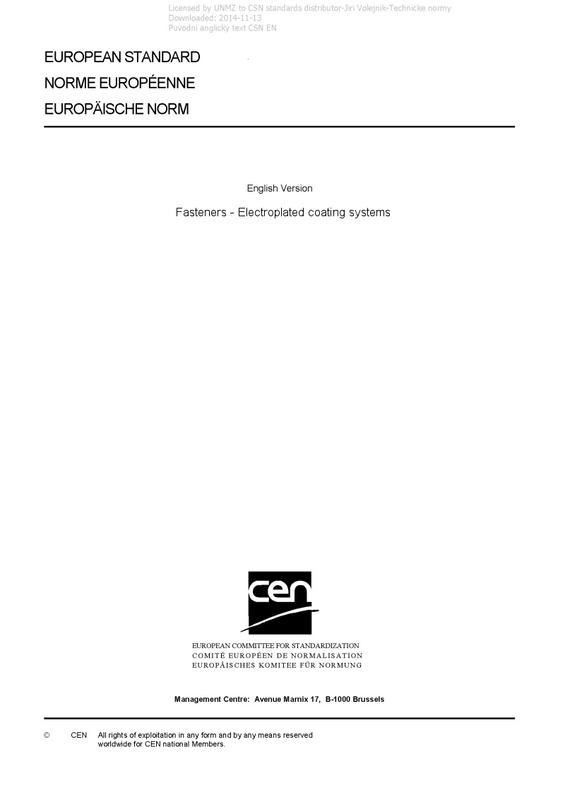 EN ISO 4042 Fasteners - Electroplated coating systems - This document specifies requirements for electroplated coatings and coating systems on steel fasteners. The requirements related to dimensional properties also apply to fasteners made of copper or copper alloys. It also specifies requirements and gives recommendations to minimize the risk of hydrogen embrittlement; see 4.4 and Annex B. It mainly applies to zinc and zinc alloy coating systems (zinc, zinc-nickel, zinc-iron) and cadmium, primarily intended for corrosion protection and other functional properties: — with or without conversion coating; — with or without sealant; — with or without top coat; — with or without lubricant (integral lubricant and/or subsequently added lubricant). Specifications for other electroplated coatings and coating systems (tin, tin-zinc, copper-tin, copper-silver, copper, silver, copper-zinc, nickel, nickel-chromium, copper-nickel, copper-nickel-chromium) are included in this document only for dimensional requirements related to fasteners with ISO metric threads. This document applies to bolts, screws, studs and nuts with ISO metric thread, to fasteners with non-ISO metric thread, and to non-threaded fasteners such as washers, pins, clips and rivets. Information for design and assembly of coated fasteners is given in Annex A. This document does not specify requirements for properties such as weldability or paintability. NOTE Other International Standards specify differing electroplating processes. For electroplating of fasteners, the requirements of this document apply, unless otherwise agreed.